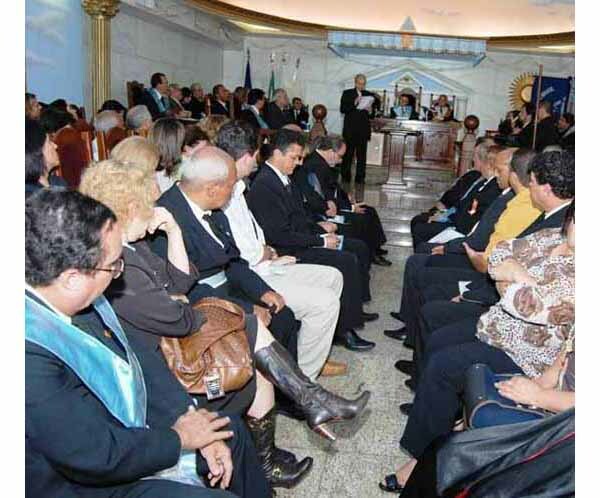 On June 25, 2009, Bishop Lelis Lara of Itabira, State of Minas Gerais, gave a lecture in the Masonic Lodge of that city. Bishop Lara, above center standing, is also a canon law counselor to the Brazilian Conference of Bishops. The speech, open to the public, was about the relations between the Catholic Church and Masonry. Lara said that he was there in the wake of Vatican II's openness to the modern world, and that it was this new attitude that made the Church change her severe laws against Freemasonry. Indeed, he mentioned that in the 1917 Code of Canon Law, canon 2335 forbade any Catholic to enter Masonry with the penalty of automatic excommunication. After Vatican II, however, the 1983 Code in its canon 1374 did away with that excommunication and does not even name Masonry when it generically tells Catholics not to enter associations that "plot against the Church." Bishop Lara pretends that we need to distinguish between two Freemasonries, one practical and another philosophical. According to him, only the latter - and then only after 1877 - was against God. Before that date, both Masonries were good and would honor the Great Architect of the Universe, God. Today, at least the practical Masonry continues to be so. As a consequence, Catholics should live like brothers with Freemasons in order to fulfill the promise of Jesus Christ that all men be one. Justifying his visit to a Masonic Lodge, Lara mentioned two precedents that took place in Brazil: on Christmas 1975, Card. Avelar Brandão Vilela of Salvador, Bahia, said a Mass in the local Masonic Temple; on that occasion he received a Masonic decoration. In 1976, Card. Paulo Evaristo Arns of São Paulo did the same in his city. To commemorate Bishop Lara's talk, the Grand Master of the local Lodge offered him a bronze plaque. 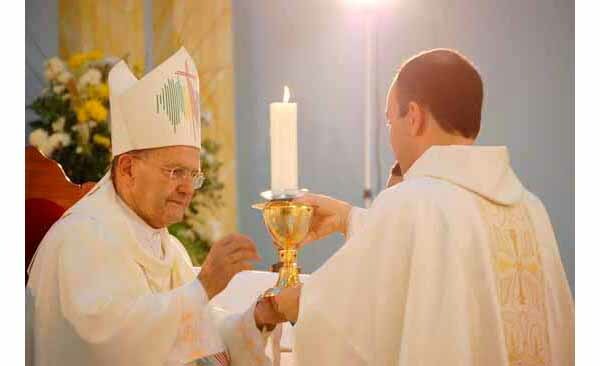 Below, Bishop Lelis Lara saying a Mass in a Catholic church on May 13, 2009.